I'm doing quite a few events & signings in the next few weeks. If you'd like to come and get a signed copy of Phoenix or Varjak Paw, here are the details! 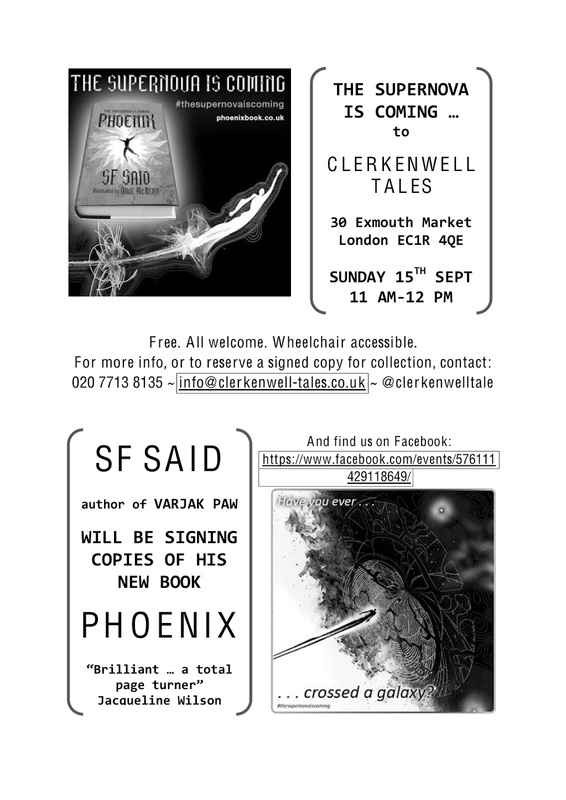 First up is a morning signing at Clerkenwell Tales (30 Exmouth Market, London EC1R 4QE) on Sunday 15th September from 11am-12pm. Everyone is invited, there's no entry fee, but there will be juice and biscuits, and signed copies of my books! Then I'm doing a signing at Waterstones Bury St Edmunds (36 Butter Market, Bury St Edmunds, IP33 1DW) on Thursday 10th October from 4pm-5.30pm. Again, no entry fee and open to all, so I hope to see some of you there! Please call (0843 290 8419), email (events@kensington.waterstones.com) or find us on facebook (Waterstones Kensington) & Twitter (@HSKWaterstones) for more info or to book tickets. Hello! I'm looking forward to the visit very much - I hope you come and say hi and get a book signed!